After his daredevil stunts in 'Khatron Ke Khiladi 3', model-turned-actor Milind Soman is all set to enchant his fans through his role of a brave cop in his upcoming film 'Nakshatra' ÃÂ a romantic thriller. It's the story of a dreamer mislead by destiny, and how he leaves no stone unturned to win his love and justice. Although the script may seem promising, the star-cast of the film may act as a drawback. Besides the charming supermodel Milind Soman & critically acclaimed actor Anupam Kher (who are the only attractions), the film stars dÃÂ©butantes Shubh Mukherjee and Sabina Sheema in the lead roles. Rosa Catalano will be seen swaying in an item number. The film, which will hit the cinemas on 29th October, is directed by Mohan Savalkar, again a new-comer. Milind, although a supermodel, has not been able to achieve success in mainstream cinema. Will 'Nakshatra' brighten up Milind's acting career? Will the film impress the audience? Ganesha finds out with the help of Vedic Astrology. Nakshatra's release time chart's Ascendant Lord is Swagruhi in the Ascendant. The Lord the 10th House, Sun is debilitated in the 12th House. 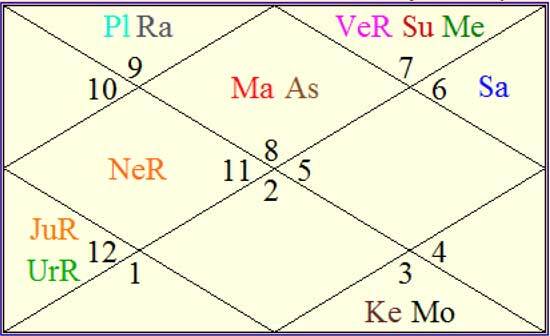 Lord of the 9th House is in the 8th House with Ketu ÃÂ a strong malefic. Venus the significator of arts is retrograde. Ganesha feels that the film may see an average opening at the box office; may be around 50 to 60 percent only, as Karma Bhuvan Lord is badly placed in the 12th House. Moon being the Lord of Bhagya Bhuvan, is weak due to its placement in the 8th House with Ketu. This may work adversely for the film's success at box office. 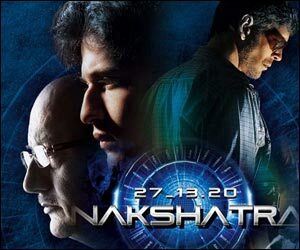 Even if there may be intense action sequences in 'Nakshatra' due to Mars' placement in the Ascendant, this film would not be able to lure the audience. Considering all the factors mentioned above, Ganesha feels that 'Nakshatra' may not do well at box office. As the Lord of the 7th House is retrograde and in the 12th House with a fallen planet, it may also face competition at the box office. Unless the release date of film changes, the film may bomb at the box office, says Ganesha.